An extreme variation to rock climbing, deep water soloing is practiced on perpendicula cliffs or cliffs leaning out to the sea, with the sea being the only protection if you fall off. It is a form of solo rock climbing that relies solely upon the presence of water at the base of a climb to protect against injury. It is occasionally known as water bouldering. Although this is viewed as a relatively new style of climbing, it probably originated in the late 1960s or early 1970s in Dorset, Southern England or Marjorca. Real development of the style began in the mid-late 1990s, and is progressing to this day. Since deep water soloing entails higher risk than regular rock climbing, there are certain rules one must keep in mind. Two: all adrenaline addicts must be aware of their physical strength and never try to exceed those limits. The higher you go, the harder you fall! The average climber uses ropes, harness, quick draw and belay devices for safety, but the deep water soloists shun these ‘extras’ preferring the extra adrenaline charge they get when climbing. As a result, in places like Thailand, budget travellers have taken a fancy to this extreme sport because it fits their low-cost lifestyle. Pinyo Changrua, vice-chairman of Railey Rock Climbing Club, disclosed that the activity was introduced to Krabi about five years ago by foreign tourists and it has increased in popularity ever since. “You don’t have to invest, taking climbing lesson or renting equipment. All you need is a pair of appropriate shoes and lots of courage,” he said. This type of climbing is typically practiced on sea cliffs at high tide, most famously on the coasts of Dorset and Devon, but also in the Calanques near Marseille, around the Southern Pembrokeshire coast, parts of Ireland, Sardinia, Majorca, Spain, Greece, Thailand and many other climbing areas. Several months ago I did a couple of articles on abseiling, and imparted the little known fact (to me at the time) that most climbing accidents occur when abseiling. Having shinned up a few faces myself, it’s the abseiling bit that I’ve always loved and probably treated rather cavalierly as a result. Fortunately for me, I have always climbed with people who know what they’re doing, and it’s probably entirely due to them that I am still here happily tapping keys, and not crumbled up in a heap at the bottom of some face! There, you see, I take abseiling too lightly. Having begun this Blog, and learnt so many things I didn’t know before, I thought it would be an idea to highlight some of the mistakes you can avoid when abseiling. A certain amount of abseil paranoia is healthy as it leads to a methodical and thorough checking process, which leaves nothing to chance. This is what keeps you alive in dangerous situations. Rapping off the end of your rope. Tie stopper knots in each end. Check they make the ground or next anchors if possible. This avoidable mistake still manages to take the lives of even experienced climbers. Rapping off a single piece, only to have it pull. Never, never rap off a single piece, unless it’s a huge tree or bollard, and even then think carefully. Don’t be cheap with bail gear. Taking a ground fall because the rope you abseiled off was not fixed directly to the anchors, but had slack caught around a hidden feature, which subsequently released when the line was weighted. Don’t rush! Make sure there is no slack between you and the anchors. Getting hair or loose clothing caught in your abseil device. Tie hair back and tuck clothing in. With in-situ abseils, check the anchors (look, feel, push-pull, twist etc). Check all parts of the system that link the anchors. Don’t assume that just because everyone else uses the in-situ abseil or someone used it recently that it’s still OK. Make your own judgement on the reliability of the set-up each and every time you use it. Back-up the anchors you’re going to abseil from by placing a separate bomber piece that’s linked to the abseil rope. This back-up should not be taking any of the load, when your weight comes on the ab rope, so you can check the in situ anchor is reliable. If you’re not returning to the same spot the last person down can remove the back-up if all looks good with the original anchors. Don’t cut corners and don’t rush your decision-making. Please bear in mind that this is by no means a definitive list. Know what you’re doing before you do it and climb with others who know more than you. You can never be too careful. Remember, this is an extreme sport and has the inherent dangers that go with it. We’re all for ‘getting out there’ and doing, rather than sitting on our bums and merely thinking. However, there is no point in taking unnecessary risks especially where extreme sports are concerned. And lastly, always make sure that your climbing partner understands your terminologies and expectations, particularly if they are newbies. In fact, always demonstrate a technique to a newbie and get them to repeat it before the climb begins so he or she knows how to do it. Or this one from papasmurfuk76 , let it be a salutary lesson to warm-up. Grand Teton is located in the north west corner of Wyoming. It is a classic alpine peak, so impressive that a whole national park has been named after it – The Grand Teton National Park. 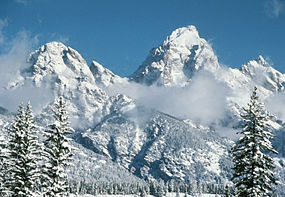 However, the mountain range itself is called ‘the Tetons’ or ‘the Teton Range’. Grand Teton itself is the highest mountain within the Park at 13,770 feet (4197 m), and the second highest in Wyoming. There is a controversy over who made the first ascent of Grand Teton. Nathaniel P. Langford and James Stevenson claimed to reach the summit on July 29, 1872. However, their description and sketches match the summit of The Enclosure, a side peak of Grand Teton. The Enclosure is named after a man-made palisade of rocks on its summit, almost certainly constructed by Native Americans. When William O. Owen climbed the true summit in 1898, he found no trace of prior human passage. It is probably that the The Enclosure was first climbed by Native Americans, while the true summit was first climbed by Owen. The Grand Teton has the most routes listed in the historic climbing text Fifty Classic Climbs of North America of any “peak”. 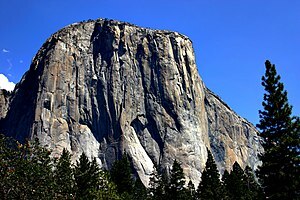 The only other “peak” to have more than one route listed is El Capitan with, The Nose and Salathé Wall. Since the Tetons first ascent, 38 routes with 58 variations have been established. The most popular route up the mountain is finished via the Upper Exum Ridge Route (II, 5.5) on the Exum Ridge, a 13-pitch exposed route first climbed by Glenn Exum, co-founder of Exum Mountain Guides. The direct start of the Exum Ridge using the Lower Exum Ridge Route (III, 5.7,) is considered a mountaineering classic. thesnazdotcom posted this video showing the climb up Upper Exum Ridge of the Grand Teton, and down the Owen Spalding route. Gives you a good idea of what to expect. There is also an ultramarathon run in the national park, known as the Grand Teton 100 Ultramarathon. The race is either a 100 mile event or a slightly less demanding 50 mile race through the Teton Mountains. The course is a “clover-leaf style” loop, with each loop consisting of 25 miles in length over terrain that includes single-track, service roads, bike trails and short stretches of pavement. The competitors will take on 5000 feet of vertical gain per loop. The 50 mile event is expected to last roughly 17 hours while the 100 mile course is estimated to take 36 hours. The race is to be held on Saturday, September 05, 2009 @ 5:00 AM – Sunday, September 06, 2009 @ 6:00 PM. Entries close on Tuesday, August 25, 2009 @ 11:59 PM. Every serious climber knows El Capitan. It is as extreme as rock faces come and has long been considered ‘a classic’ around the world. A sheer granite face rises 2,900 feet straight up. A fall means certain death. It is one of the most hair-raising and arduous vertical climbs in the world and is arguably the single biggest rock climbing challenge. Once considered impossible to climb it now sets the standard for big-wall climbing. The most popular and historically famous route is The Nose, which follows the massive prow between the south west and south east faces. The Nose was first climbed in 1958 by a team of 3 who took 47 days using ‘seige’ tactics to conquer it. They climbed in expeditionary style using ropes along the whole length of the route, establishing camps along the way. They relied heavily on aid climbing – using rope, pitons and expansion bolts to make it to the summit. The next ascent, in 1960, took just 6 days by a team of 4. This was the first continuous climb of the route without siege tactics. The first solo climb of The Nose was done by Tom Bauman in 1969, and the first single day ascent was accomplished in 1975 by John Long, Jim Bridwell and Billy Westbay. Today The Nose attracts climbers of various experience and ability levels, and, with a success rate of around 60%, typically takes fit climbers 2-3 days of full climbing. First up were Hans Florine, who grew up in Moraga, California, and Yuji Hirayama, of Hidaka, Japan who set the record at just under 3 hours. Then along came the Huber brothers, from Germany, who, on the 17th October 2007, took 3 minutes off that time and set a new record at 2 hours, 48 minutes, and 35 seconds. Florine was not new to the face. He first set The Nose speed record with Steve Schneider in 1991, reaching the top in 8 hours and 6 minutes. It was broken a week later. It has since been broken nine times, Florine repeatedly reclaiming the fastest time. World renowned climber Dean Potter and he traded The Nose record several times starting in 2001, prompting one magazine to run a photo illustration of them glaring at each other. Having had their record broken by the Huber brothers, Florine, now 44, and Hirayama, 39, were determined to get it back and on July 2nd, 2008 they pulled themselves over the top of the immense slab of granite and touched the tree that serves as the finish line in just 2 hours, 43 minutes and 33 seconds – meaning they averaged about 17.7 feet per minute. It was 2 minutes and 12 seconds faster than the Huber brother’s record breaking climb. At one point, the pair were 10 minutes ahead of the record pace, but mistakes and exhaustion slowed the climbers down. Thirteen climbers have been killed in nine separate accidents on the route since 1973, when Michael Blake, 19, of Santa Monica fell 2,800 feet after his body weight yanked a bolt out of the wall and severed his rope. Twenty-four people have died on El Capitan since 1905, sometimes because they forgot to do something as simple as tying a knot. Speed climbing is even more risky – forcing climbers to scale large sections of the route virtually unprotected – but it has become an integral part of the history of Yosemite. That’s a minute faster than the average length of a major-league baseball game in 1986 (but those have generally gotten longer since then). And it’s two minutes shorter than the time it took for the Titanic to sink below the surface after its iceberg collision on April 14, 1912. Enjoy this excerpt of their climb, with thanks to 1stonemaster for posting it. Don’t laugh… this is not an uncommon comment to over-hear at some stage in your rock climbing career! You don’t need to be young or extremely fit to learn to rock climb. Learning to climb is very much like learning to ride a bike. You’ll never forget the basic moves, but will need years of practice to perfect them! Climbing is not all about strength. It is also about balance, knowing your body and being able to reposition it in space. It’s about creativity, learning to adapt to what the rock has to offer, and it’s about concentration and overcoming your fear of heights. One of the best ways to learn how to rock climb comes from climbing with other people; you learn new tricks and techniques from climbers more knowledgeable than you are and later on, when you become more experienced, you, in turn, will be able to offer something to a partner who has less experience than you. A lot of beginners are told “Go take a course”. Taking a few classes can help enormously, but most avid climbers will tell you that you will learn more by getting out on the rock with someone more experienced than you. Books offer useful advice, but can’t cover every situation. Written communication has inherent flaws. It is difficult to convey tone and body language in the written word. They can however give you a good start, but it’s not the real thing. You have to be out there, on a rock, with other climbers, following their example, taking advice and learning from them, and from your mistakes. If you don’t personally know any climbers, try and find a mentor. This can be difficult. There are fewer people out there prepared to mentor someone than there are people looking for mentors. A catch 22 situation. It is worth bearing in mind that people who show determination, reliability and a good attitude attract mentors more easily – stands to reason doesn’t it? Always ask questions and accept constructive criticism. So many people just want to climb without taking the time to learn. It needs to be said, and repeated, that rock climbing IS an extreme sport, an extreme sport where accidents can easily happen. Don’t take risks. Don’t rush. Do it right from the start. There are so many mistakes that can be made: from the very obvious, although easily forgotten things, such as forgetting to take water and sunscreen, and not warming up before a climb; to the less obvious and more complicated – like choosing an anchor that is not strong enough, using regular rope and not climbing rope, having shoes that are too loose, not knowing your knots properly, getting to the top of your climb and untying your rope, subsequently losing it – “Help someone – I’m stuck!” These are just a few of the things that newbies can get wrong. Climbing is both an individualistic and social sport: when you’re on a rock you can only count on your own skills to get you to the top. However, if you do fall, you will be trusting your climbing partner with your life. Beyond question. No mistakes allowed. This often makes for very strong bonds and relationships. Choose your climbing partner with care! So remember, hands on experience is what really matters. Books and advice on the Internet are useful – but very few learning methods can substitute hands-on experience. You won’t go wrong by supplementing your book or Internet gained knowledge with questions to experienced people in the real world, but you may go wrong by NOT doing so. Climbing is a never-ending learning curve. You will astonish yourself by how you will always learn something new on any individual climb. Should a fear of heights put you off rock climbing? What a wonderful quote – so apt for so many of us. Which is why we love extreme sport … pushing your limits gives you the sense of living life to the full, and it doesn’t mean to say you have to be dangerously stupid about it. And rock climbing is an extreme sport that has a bit of everything – adrenaline kick, the great outdoors, exercise, personal challenge, mental endurance … I could go on for ever. A fear of heights (acrophobia) need not be a deterrent to starting this sport. A lot of rock climbers have a fear of heights, but they have subsequently discovered that their fear of heights was more a fear of falling. “I have always been afraid of heights, but as most climbers seem to find, it is really a fear of falling. Learning to trust the security of the rope has allowed me to get up high without freaking out. But still, the knowledge of hundreds of feet of air below you stays in the back of your mind, and gravity is unforgiving,” says Steve Branam. It comes down to practice and repetition. You have to learn to trust the equipment and yourself. So practice, practice, practice, indoors and out. You can boulder to develop climbing ability without feeling acrophobia, and then this confidence will help fight the fear up high. In fact, when you are climbing you are so concentrated on the next move that you seldom have time to remember your fear of heights. To overcome your acrophobia you need to program your unconscious mind with a healthy level of wariness and then use that wariness to replace your irrational terror. What exactly is acrophobia? It’s one of those things where if you are wondering if you experience it or not, then it’s almost certain you don’t. It is when you look out from the balcony on the second floor and feel safer close to the wall or you hold on maniacally to anything secure, or when you feel dizzy on a mountain trail and have to crawl on all fours, grabbing every blade of grass for the illusion of safety, but are pretty certain anyway that you will fall at any moment. If you look down, the world seems to spin and sway, your stomach contracts, you forget to breathe regularly, mouth dries out, you start sweating like a pig and panic sets in and you swear that if you ever get down alive, you’ll never set foot on a hill again. That’s acrophobia! Or, as the dictionary says, ‘a pathological fear of heights’. Remember, rock climbing is only as extreme as you choose to make it. Acrophobia will not be beaten overnight. It is a slow and steady process, but it can be done.